The Transformers Lost Seasons all-including thread! Starting today, the Lost Season updates will be featured exclusively in this thread! The Lost Seasons present 'Bot Scouts and Agreement. More about this on the SoD/LS blog! A tale from the Beast Wars era: Among Wild Beasts! 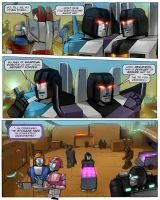 The Transformers: Seeds Of Deception project presents a new story of the twin project Transformers: The Lost Seasons. Story by Subtilisin and Juan Pablo Osorio. Art by Subtilisin and Mitsuko Hazama. Young Orion Pax is about to meet his heroes: the Seekers, and especially their glamorous leader, Starscream! But do Megatron and Shockwave have anything to say about this? The Lost Seasons presents one of its largest updates ever: a 14 pages comic (plus cover and intro page) which is also an actual lost episode from the Generation One portion of the Lost Seasons continuity! It's Eye Of the Beholder, based on an unused G1 Transformers cartoon episode premise by Cary Bates and Greg Wiseman. Because of the great amount of pages, we're not sharing all the links, just the story folder (see above) and blog entry links (see below, just click on the cover). Also: From Season 2.5 of the Generation One timeline, a tale that brings back Powerglide and his unlikely girlfriend, Astoria Carlton-Ritz: Breaking In. The Lost Seasons presents a double update. 1) Born On the Battlefield is a TFTM86 tie-in, featuring Metroplex' drones. 2) Round Table is a 5-pages story from Cybertron's ancient times: the Lawless Times. Featuring the Protectobots, Aleph Ter and the never-seen-before-in-action Pion Rex. The Lost Seasons presents a Beast Wars sequel story! 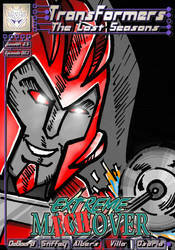 It's Make Way For the New, featuring Dinobot II and his all-new cross-faction team! Polar Claw, Manterror, Noctorro, Sky Shadow and... Tarantulas' latest secret! Check the blog for more updates and notes! The Lost Seasons presents a Beast Wars prequel story! From Season 9, Transwarp: Ravage chronicles the transition from Generation One to Beast Wars, featuring Rodimus Prime, Ultra Magnus, Razorclaw and Laserbeak! The Lost Seasons presents a Generation One story from Season 2.5. 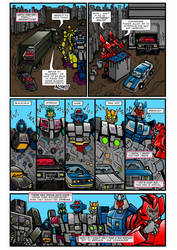 It's The Ties That Bind, featuring Optimus Prime, Elita One, Ultra Magnus, Alpha Trion, Ariel, Dion, Vector Sigma, Ratchet, Wheeljack, Perceptor and more! This story is a direct prequel to Attack of the D.I.A. Clones, and it's 11-pages long, so you'll have to go directly to the Blog post to see all of them (or just click on the story link above to reach the folder). 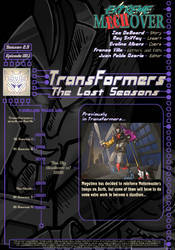 Transformers: The Lost Seasons project presents a Season 2.5 tale: Solaris. Featuring Comsos and an all new Cybertronian Gestalt, this story is all about science, deep space exploration and unimaginable secret. For those who used to wonder why Cosmos's alt mode is so weirdly shaped, the answer can be found here, as the little and lonely space-faring Autobot rejoins his original Combiner Team, the Quantabots! Also featuring the Combaticons and Bruticus, this comic is a truly Combiner War, deeply rooted in Cybertron's past... and future! What is "The Vortex" and what does hide behind that? "Solaris" is available in PDF format, both for download and online browsing. 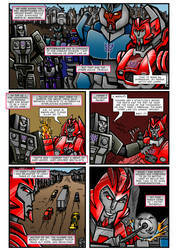 The collected edition also features a special bonus: the five Profiles of the Quantabots, done in MTMTE Guidebook style! Set in G1 cartoon continuity, this story is connected to episode Fight Or Flee of Season 3, as revealed by the appearance of the Titanium Hope spaceshift. Lineart and story by Joe Teanby. Colors by Jason Nangle>, Zerob, Navtej Heer. Story and lettering by Franco Villa. Transformers: The Lost Seasons project presents the commentary version of Solaris. It's a Season 2.5 tale (also available in PDF format), featuring Cosmos' secret, the Combaticons, Bruticus, a new Cybertronian Combiner and... the Paradron Vortex! Transformers: The Lost Seasons project presents the MTMTE-styled profile of the combined form of Metroplex's drones: Scamper, Slammer and Six-Gun . By Joe Teanby, Franco Villa, Juan Pablo Osorio. Transformers: The Lost Seasons project presents the profile for Solaris, the space-tech-based Autobot Gestalt. By Joe Teanby, Navtej Heer. 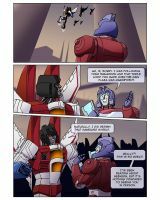 Regeneration Plus #4 - "The Unnamed (1): Rising Star"
Sixshot's secret origin: from Cybertron to Nebulos to... a powerful entity that has been traveling in space since the age of Boltax! Regeneration Plus presents the first installment of Regeneration Plus #4: "The Unnamed (1): Rising Star". Featuring the cast of the original G1 Marvel US Headmasters miniseries: Scorponok, Fortress Maximus, Snapdragon, Apeface, Skullcruncher, Cyclonus, Scourge, and more! By Nicola Balocca, Joe Teanby, Jason Nangle. Transformers: The Lost Seasons project presents Precursor. Laser Core or Spark Core? Matrix of Leadership or Creation Matrix? Rodimus Prime or Unicron? Grimlock or Primacron? Technobots or Tornatron? So many questions, and just one answer, coming from the geniuses who gave life to so many Cybertronians without even using the Matrix! By Joe Teanby, Dohee Lee, Nicolas Siregar. Re: The Transformers Lost Seasons all-including thread! The latest Season 2.5 episode brings new kids on the block, as Motormaster is forced to replace some of his Stunticons... but what does the recently-arrived medic Knock-Out in store for the brutal Decepticon commander? By Zac De Board, Roy Stiffey, Eveline Albers.